Do you advertise on LinkedIn? Have you considered LinkedIn advertising and want to learn more? To discover everything there is to know about LinkedIn ads, I interview AJ Wilcox. In this episode, I interview AJ Wilcox, a LinkedIn ad expert. His agency, B2Linked, specializes in business-to-business advertising and lead generation on LinkedIn. In addition to managing accounts, AJ also specializes in LinkedIn ads training. AJ explores the different types of ads available on LinkedIn. 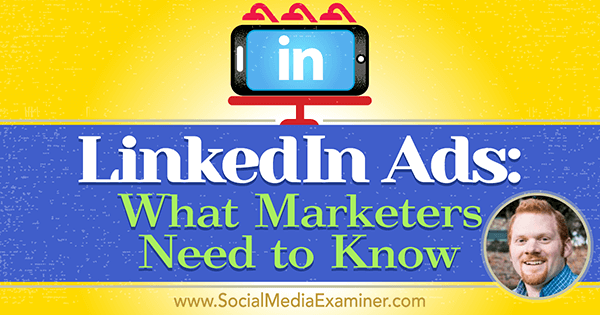 You’ll discover what B2B marketers need to know about advertising on LinkedIn. 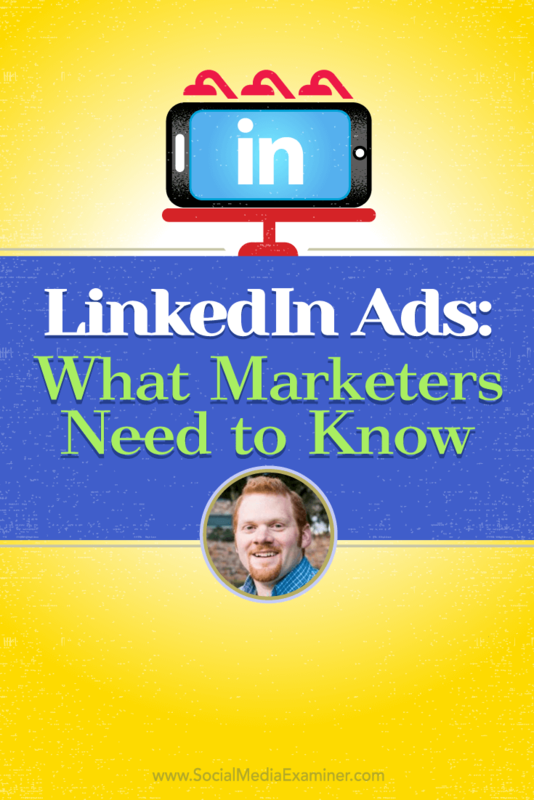 Listen as AJ Wilcox shares what marketers need to know about advertising on LinkedIn. AJ is a long-time digital marketer who started out doing search engine optimization (SEO) and Google AdWords. About four years ago, a company in Utah recruited AJ. On his first day, he laid out his plans for SEO, pay per click, and social media to the CMO. She gave him the go-ahead and also informed him that the company had started a pilot program with LinkedIn ads. “See what you can do with it,” she said. AJ replied, “absolutely,” and then turned around and started laughing to himself. He felt like a veteran at digital marketing, yet had never heard of LinkedIn ads. He jumped into the platform to learn about it to try to keep the egg off his face. Within about two weeks, one of the salespeople approached AJ, telling him how much they loved the leads they’d been getting. When AJ discovered through Salesforce that the leads were all sourced from LinkedIn, he realized there was something to it. Listen to the show to hear how AJ started his business, B2Linked. AJ explains that while Facebook’s and LinkedIn’s ad platforms are very different, they share the same principles. That means that if you have something nailed on Facebook, it will probably work well on LinkedIn and vice versa. While AJ doesn’t run Facebook ads for his clients, when he’s compared similar campaigns from Facebook to LinkedIn, he’s found his conversion rate on LinkedIn to be about double that of Facebook. Plus, the sales teams have told him the LinkedIn leads are much higher quality than the ones from Facebook. LinkedIn is by far the best for B2B targeting, he continues. You can target by job title, seniority, company, skills, specific group membership, geography, and years in business; information people aren’t putting on Facebook. 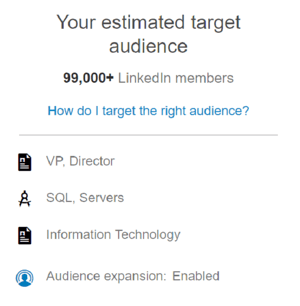 There are a lot of options for LinkedIn ad targeting. AJ shares what he believes are the two best uses of LinkedIn ads. Number one is recruitment and the other is promoting B2B products and services such as an SaaS company (software as a service). Those businesses charge a substantial ongoing rate ($6,000 to $7,000 per month) for access to their software and have a lifetime value of more than $15,000. If you have a lifetime value of under $15,000, AJ cautions, make sure your funnel and your processes are really ironed out on Facebook first, because LinkedIn’s cost per click (CPC) is much higher than Facebook’s. Listen to the show to discover how to calculate lifetime value. When you go to LinkedIn.com/ads and start a self-service account, you’ll have access to two different ad units. There are usually three text ads visible in the right side bar. AJ explains the first type is text ads. These ads appear in the right sidebar of the LinkedIn homepage (on desktop) and you’ll often see three ads there. According to AJ, text ads have a low click-through rate because most people are banner-blind to them. If four people click on them out of every 10,000 times they’re viewed, you’re doing great, he says. Since people understand these are ads, AJ believes it’s more appropriate to use text ads for hard sell call-to-action offers, like “Get a Demo” or “Talk to Someone.” Text ads get viewed a lot, so they can be good for branding. Just make sure you have your brand name in them. There are a few different sponsored formats such as video, large image, or text links. They look similar to those on Facebook, but have more characters and take up more room. Like on all social media platforms, when someone interacts with the content (for example a like, comment, or share), you get charged for that click. 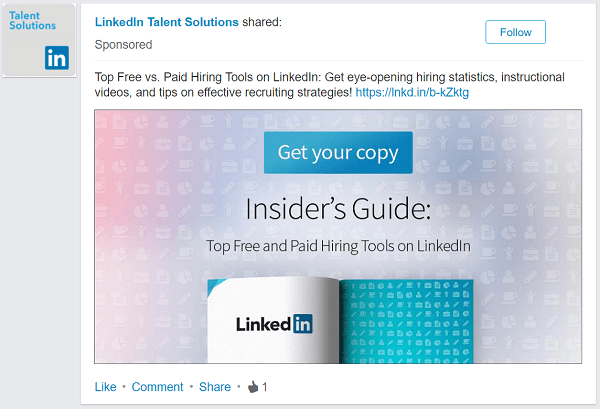 Sponsored LinkedIn ads are similar to Facebook promoted posts and appear in the mobile and desktop news feeds. As far as formatting is concerned, you get 128 characters in an intro (you can go over, but the copy will get truncated), 36 characters for the headline, and 155 characters for the description. Plus, you get an image that shows up at 200 pixels wide on desktop and a little wider on mobile. Listen to the show to find out why AJ doesn’t recommend video ads on LinkedIn. AJ shares his four favorites, which he calls his four pillars of targeting. First is job title targeting, which is similar to what’s on Facebook. You rely on people telling you their job title and a computer aggregates the data to put similar job titles together. Targeting by job title is usually a little more competitive because most B2B advertisers jump right to it. Next, there’s job function in combination with seniority. Job function is someone’s department. For instance, if you’re looking for IT directors, you could say job function is “IT” and seniority is “director.” Overlap those two things and you’re left with directors of IT. 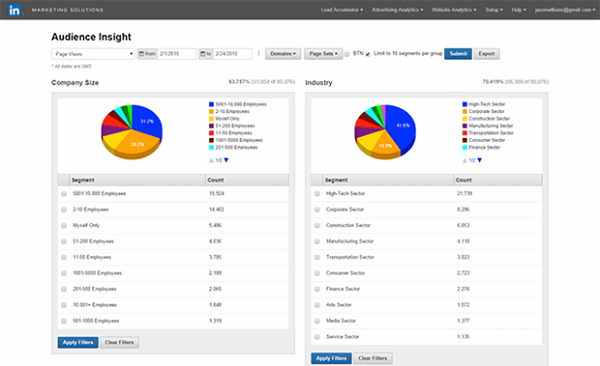 Combine targeting options such as groups and seniority. Skills targeting is the third pillar. Again, for IT, you may want to target skills (like SQL or server distribution) that IT people have. Select those skills and then apply the seniority filter on top of it. For instance, choose skills and then “director” for seniority. AJ’s final favorite pillar is groups. A group called “IT Professionals” will probably have IT professionals. 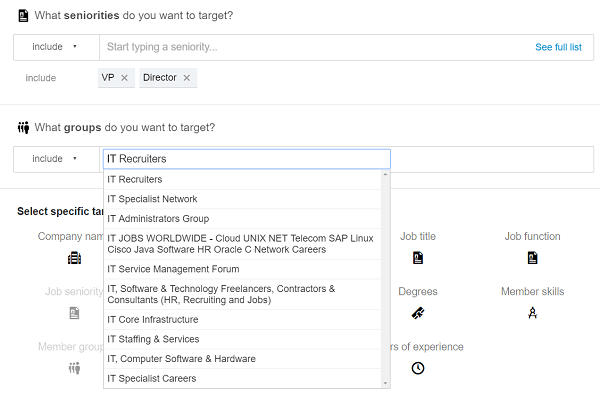 Target those types of groups and then maybe layer a seniority filter of “VP” or “director” on it. LinkedIn ad targeting is also similar to Facebook’s in that the more targeting layers you apply, the higher the bids and CPC. The cost will go up, AJ says, but not too much. The other thing targeting does is that as you build a campaign on LinkedIn, every time you add a new filter, you can see your audience gain precision. As you build a campaign, the audience gets more precise. You can also target any group; you don’t need to be a member. Inside the ads platform, you can type a word and all groups containing that word or a related word show up. Then click to add. You can also go into LinkedIn and do a search for groups and find the ones that look the most active. Of course, you would probably have to join the group to see that. To get started with targeting, AJ suggests two approaches. Either target by job title or go right to groups, since groups show people with a certain level of engagement on a topic. For instance, if you’re trying to sell an AdWords-type offer, you probably want to get prospects who are members of an AdWords-type group. AJ shares a few more insights and options about targeting. First, location is required. When people set up their profile, they tell LinkedIn where they’re located. That’s the area LinkedIn uses when you target a specific geolocation. On Facebook, they take the location of your IP and send you offers for where you are. Can you separate desktop and mobile for targeting? AJ says no. If you need to do a desktop-only offer, use the right sidebar text ads, because those are only shown on desktop. If you’re targeting using sponsored updates, 65% or more of your traffic is going to come from mobile. There are also a couple of things to consider when deciding whether to turn an existing organic post into a sponsored update. Since AJ is usually running lots of campaigns, he needs to track every ad with a unique tracking parameter to keep the results straight. When you boost an organic post, you won’t be able to tell what engagement came from the boost and what came from organic reach. On the other side, if you boost a post, you gain the benefit of social proof. People have already interacted, commented, and liked the post. So by the time you advertise, it looks like it’s a hopping topic and people will be more willing to interact with it. Note: You only pay for the first action on your ad when someone shares it. When your friends click it, you don’t pay. Listen to the show to hear best practices on images for LinkedIn ads. If you’re being aggressive, AJ says you’ll pay somewhere between $6 and $8 per click, though you can get cheaper. It’s determined as an auction, just like AdWords or Facebook ads. 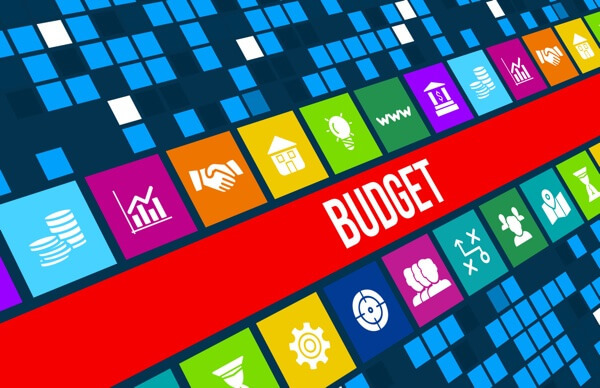 You can budget for CPC or CPM. AJ thinks it’s so expensive because on average, people spend about 17 minutes on LinkedIn every week, so there’s not a lot of inventory for ads to run. On Facebook, people spend 4-5 hours per day. That’s lots of inventory for ads, so it brings the cost down. As an advertiser, you can pay per click or per 1,000 impressions (CPM). AJ recommends starting with CPC because it shifts the risk to the platform. If no one clicks, you don’t pay and LinkedIn eventually shuts it off. Once you have an ad that gets clicked at a really high rate, switch to CPM. When AJ does that, he usually gets a $1 or $2 per click discount immediately. Listen to the show to learn the click-through rate at which AJ switches from CPC to CPM. Since LinkedIn’s advertising platform is on the dated side, there is one third-party tool for management of your ads available called AdStage.io. They have API access to Facebook, Twitter, LinkedIn, AdWords, and Bing Ads. It’s one platform to manage all of those and is the power tool AJ uses for getting heavily into LinkedIn. On AdStage, you have the ability to do things like day parting (running ads only during business hours or only on weekends), which you can’t do with LinkedIn’s Campaign Manager. 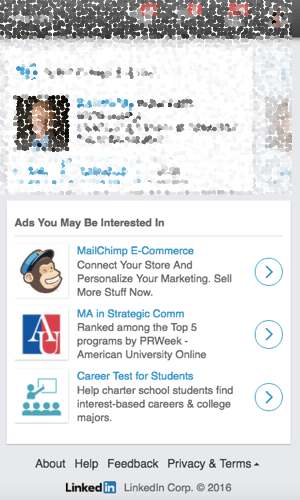 AdStage is the only third-party tool available for managing LinkedIn ads. Currently, LinkedIn doesn’t have a retargeting solution, though it looks like it’s coming soon. For right now, AJ suggests running all of your LinkedIn traffic to your website. Then use Facebook, Twitter, and AdWords retargeting to pick up that traffic and show people ads on those other networks. Listen to the show to discover how AJ sets UTM parameters for retargeting. LinkedIn’s analytics and reporting are pretty weak, AJ believes. 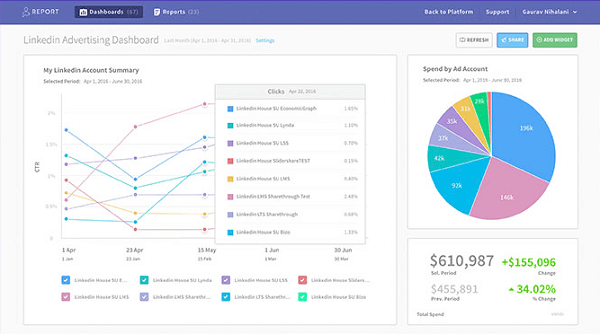 By default, you can do a campaign-level or an ad-level report. Plus you can change the time period. However, they do have what they call Audience Insights. LinkedIn looks at all of the people who clicked on your ads (either account-wide or in a single audience) and populates eight different graphs: seniority, job title, geography, and so on. For example, you can look at the graph and see that 60% of the people who clicked on your ads have a VP or above seniority. That tells you that you may be resonating really well with that group. As you build your campaign, targeting gets more precise. AJ recommends easing into LinkedIn ads to get started with a win. First, choose your audience. Make sure they’re as relevant as possible to your offer. Then, start with a very low-friction type of offer such as a white paper, ebook, guide, or checklist. This should be something where you ask for very little, like an email address, which will give you the best chance of success. Then if you’re successful, introduce an offer where you ask for a phone number, job title, or other information. Start easy and branch out as you scale. Listen to the show to learn the last thing you want to do with your ad budget. Do you ever find yourself trying to film something either on your laptop, computer, or smartphone and you don’t have a wide enough lens to get everything in the picture? Check out FUNIPICA. This is a great way to either take a picture in a selfie mode with lots of people or get a much wider view of wherever you are. Maybe you’re outside doing a live video show and want to get the totality of your experience on site with a wider lens. This product is a 0.36 super-wide lens. Unscrew the top of it and turn it into a 15x macro lens, which allows you to get in really close up; much closer than with just the camera built into your device. Listen to the show to learn more and let us know how FUNIPICA F515 works for you. Learn more about AJ on B2Linked.com. Sign up to get notified about AJ’s LinkedIn ad courses and receive his initial course for free. Explore search engine optimization and Google AdWords. Read about LinkedIn’s acquisition and disassociation with Bizo, as well as the precursor to their remarketing solution. Check out FUNIPICA F515 on Amazon. What do you think? What are your thoughts on LinkedIn ads? Please leave your comments below. 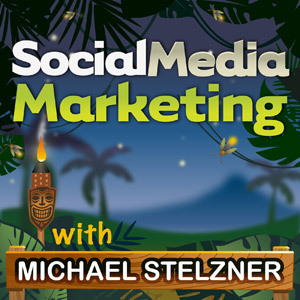 AJ Wilcox talks with Michael Stelzner about LinkedIn ads.